What if every major multinational company and corporate foundation moved from a check-the-box CSR model to a holistic, tri-sector engagement approach focused on improving lives? Imagine solving some of the world's most intractable problems with joint initiatives that leverage the best of the private, public and non-profit spheres to develop sustainable solutions that address systemic problems. It is a shift in the global business culture and leadership mindset, particularly here in the West, that is just now starting to take root and build traction. I have worked in the corporate diplomacy and tri-sector engagement arenas for nearly two decades. In all my efforts with companies and their foundations, rarely have I seen this approach fully embraced at the very top with the most senior leadership rolling up their sleeves and getting dirty to get things done. Many companies and corporate foundations 'talk' about doing things differently and having an 'impact' though too few actually invest in building sustainable programs from the ground up, working in true partnership with locals to bring about sustainable change and improve lives. This is just the approach though that the John Deere Foundation took when it partnered three years ago with PYXERA Global to create JIVA, the Joint Initiative for Village Advancement in Rajasthan, India. JIVA, which translates to "life" in the local Mewari dialect, aims to improve the lives of those residing in three villages in Rajasthan. 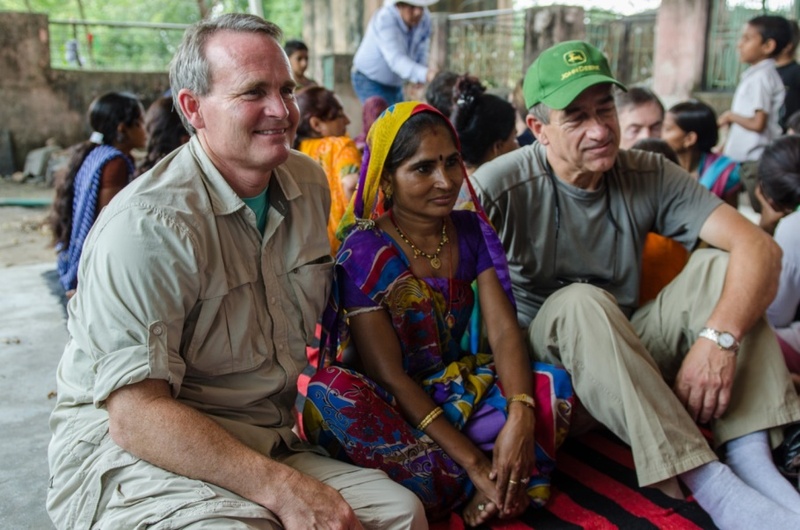 JIVA was born from a 2011 corporate service trip in which Sam Allen, Chairman and CEO of Deere & Company, led a team of executives on a volunteer experience in rural Rajasthan. The team spent one week working alongside farmers in these villages harvesting crops, cutting fodder, and helping to build livestock feeding bins. From this initial interaction, the John Deere Foundation decided to invest in a longer-term initiative. Since then, the John Deere Foundation, PYXERA Global, local NGO Jatan Sansthan, and the villagers have worked together to improve conditions in subsistence farming, education, and small-scale infrastructure. More than 50 percent of farmers have adopted one or more improved agriculture practices, resulting in increased profits for local farms. More than 50 percent of all village children are enrolled in JIVA's after-school program, including 100 percent of all drop-out students. Of those drop-outs, 84 percent have been reintegrated into formal schooling. In a region where individuals live on less than an average of $2 per day, JIVA is creating more than 70 full- and part-time jobs. When I reached out to the John Deere Foundation for insight on their approach with PYXERA Global and why the project was different, President Mara Sovey said there was commitment at every level. "What makes JIVA unique is that we actually began the project with a volunteer program, led by our CEO, Sam Allen. Throughout JIVA's development, we used our expertise and core competencies to make a sustainable impact and complement every activity along the way with employee volunteerism." I also reached out to PYXERA Global CEO, Deirdre White for her thoughts on the effort. "First and foremost, we actively listened to the communities in Rajasthan through a comprehensive needs assessment," advised White. "This project has stronger early results than anything I've seen in my career. Senior leadership at the John Deere Foundation embraced the project at the highest level. This gave us the creativity and flexibility in how we approached the community. We were jointly focused on sustainable impact from day one of this project. This allowed our teams the room to assess and adjust along the way so the program would be targeted and tailored to the community's needs." Since 2013, villagers have invested over $14,000 dollars in agriculture and education-related infrastructure. For comparison's sake, this would be the equivalent of a five-person U.S. household living on an annual income of $27,376 contributing $219 to improve their neighborhood. This kind of personal investment indicates a behavioral shift that many in the development community consider the Holy Grail - a commitment that demonstrates the community's ownership in its own development. Moreover, villagers from neighboring areas are seeing the changes in the JIVA villages and have asked how they can emulate these best practices in their own communities. JIVA was recognized last month by the Committee Encouraging Corporate Philanthropy (CECP) as the recipient of their prestigious Director's Award for exemplary corporate-nonprofit partnership. Given the geopolitical climate globally, it is more critical now than ever that multinational companies and corporate foundations take the lead in solving many of the world's greatest challenges. They are best positioned, as JIVA has shown, to create sustainable impact in the communities they serve. As a collective corporate community, we should celebrate efforts like this and actively work to share best practices so that we can emulate and scale similar interventions in the communities we touch every day.